Ikaruga (斑鳩, literally Japanese Grosbeak, a species of bird) is a vertical shoot-'em-up developed by Treasure. It is a spiritual successor to the Radiant Silvergun. Despite the fact that only a few people were involved in its development, the game features full 3D landscapes and a full soundtrack. Ikaruga was well received by critics, and remains a popular game for score-attacking and the like. Meanwhile, a freedom federation called Tenkaku emerged to challenge Horai. Using fighter planes called Hitekkai, they fought with the hope of freeing the world from the grips of the Horai - but all their efforts were in vain. They were no match for the Horai and were eventually almost completely wiped out. Miraculously, however, one young man survived. His name was Shinra (森羅). The Ikaruga was no ordinary plane, designed by former engineering genius Amanai (天内) with the help of Kazamori (風守) and the village leaders. Hidden in a secret underground bunker and launched via the transportation device called the "Sword of Acala", it is the first fighter built that integrates both energy polarities, and is capable of successfully switching between the two. In a two-player game, Shinra is joined by Kagari (篝), a mercenary of Horai defeated by Shinra. After Shinra spared her life, she decided to change sides and join the resistance. Her ship, Ginkei, is modified by the people of Ikaruga to give it identical capabilities to Shinra's ship. Ikaruga's gameplay centers primarily around the black/white polarity system. Only bullets of an opposite polarity can destroy the player's ship. Same-color bullets are absorbed and converted into energy for use by its special weapon, a homing laser. Switching the ship's polarity also changes the color of its bullets, and shooting an enemy using opposite-polarity bullets deals double damage. Thus, much of the challenge of Ikaruga comes from the pressure to carefully choose and switch between polarities, choosing between high damage and (relative) invulnerability. This is especially true when fighting bosses, which often fire bullets of both colors in overlapping patterns. The game also presents navigational challenges where the player must maneuver through continual streams of weapons fire, using their shields to absorb one color while avoiding the others. Treasure previously experimented with colors and polarity in the game's prequel Radiant Silvergun, as well as in Silhouette Mirage. Skilled players may add an extra layer of complexity to gameplay by performing combination "chains" for additional points. A chain occurs when three enemies of the same polarity are destroyed consecutively. The more sets of three enemies that are destroyed in a row, the more points are acquired, eventually rewarding the player with an extra chance/life. On the opposite end of the spectrum is the entirely original "bullet/dot eater" strategy, wherein the player simply avoids or absorbs enemy fire, and does not return fire at all (including bosses, which retreat after a set period). Both the arcade and home versions of Ikaruga feature a Trial Game mode, where infinite lives are awarded for a single credit on the first level, but only the first two chapters of the game can be played, offering a good way to practice. In addition, the game features a two-player simultaneous mode, an in-depth slow-motion tutorial mode (with stage tutorials becoming accessible to players who reach them in the main game), and an in-game art gallery featuring designs by the game's character/object designer and illustrator Yasushi Suzuki. The original arcade version of Ikaruga was played in portrait orientation. The home console versions accommodate home TVs by defaulting to a portrait display with the sides of the screen left black (YOKO mode), but do feature an option to rotate the game's display by 90° (TATE mode) so that it can be displayed in full-screen portrait orientation like the arcade version. By default, this mode requires the player to turn their monitor on its side in order to be played properly, but this can be circumvented by reconfiguring the directional controls, effectively changing the game from a vertical scrolling shooter to a horizontal one. Ikaruga was developed by a core team of only a few people at Treasure. Supporting team members were provided on a contract basis by G.rev, which was then a young company attempting to raise funds to develop Border Down. Development took over two years, a long time by arcade shooter standards. It was released first in arcades on the Sega NAOMI platform in 2001, and next it was ported to the Sega Dreamcast in 2002; both releases were exclusive to Japan. The print run for the Dreamcast version was very limited, numbering just 50,000 copies, which like the arcade release were distributed only in Japan. For this reason, the Dreamcast version is considered rare and fetches high prices on internet auctions. A worldwide release for the Nintendo GameCube came in 2003, albeit with the PAL version being badly converted (to convert to 50 Hz, the localisers simply dropped every sixth frame, creating judder) and buggy. An Xbox Live Arcade version was released on April 9, 2008. It includes online multiplayer co-op, leaderboards, and two screen modes (horizontal letterboxed and vertical, like the YOKO and TATE modes described above). Ikaruga was the first game for which Treasure released an official Superplay video, the Ikaruga Appreciate DVD (before Konami released their Options and Perfect DVDs for Treasure and G.rev's Gradius V). Although Ikaruga garnered modest sales, it is among the most successful and recognized arcade shooter ports of the 2000s. Though the official online scoreboard is now defunct, players still exchange high scores and gameplay videos on sites including Ikaruga.co.uk. In its first week, the Dreamcast version of Ikaruga debuted 5th on the Weekly Famitsū Magazine Top 30, selling about 18,596 units. In its first week, the GameCube version debuted at number 20, having sold about 6,916 units. In both cases, by the next week it had dropped off the chart. GameRankings places the average review score for Ikaruga at 85%. Metacritic gives the GameCube version a metascore of 85/100. ScrewAttack voted Ikaruga the 2nd greatest 2D shooter of all time, while IGN voted it the 3rd greatest. ScrewAttack also declared it #9 on their top ten GameCube games. Gametrailers rating it #5 on their top ten most difficult games. 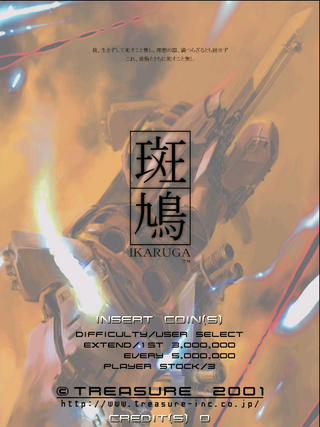 Ikaruga.co.uk aims to be the most valuable Ikaruga related resource on the internet, and includes scoreboards, downloads, a discussion forum, and IRC chat.